Today we commemorate “Pearl Harbor Day.” Sixty-nine years ago, “Battleship Row,” in Pearl Harbor, Hawaii, was attacked with vehement force and incomprehensible destruction by the Imperial Japanese Navy. The next day, in his address to Congress and an anxious nation, President Franklin D. Roosevelt called December 7, 1941 “a date which will live in infamy.” And thus we were drawn into fatal conflict with Japan, and soon after, with Germany. And it is fitting that we should remember America’s war effort, even during this Christmas season. 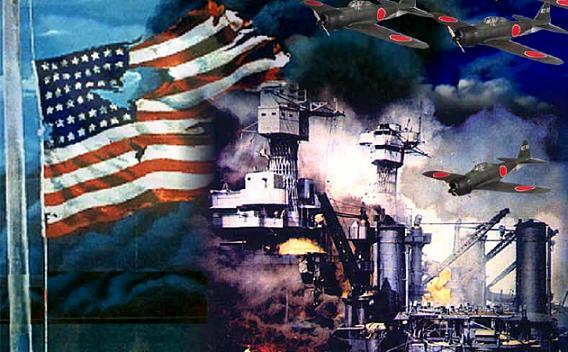 It was during this season that the United States entered the war with Japan, in direct response to the attack on Pearl Harbor. American service men and women engaged the enemy for several consecutive Christmases during World War II. Notable events of the Second War happened during the Christmas season. Today, the United States is engaged in war in the Middle East, and many American men and women will be far from home at Christmas, while others prepare to be deployed. This is the classic reenactment of events during the attack on Pearl Harbor. It re-tells what happened, from both the American and the Japanese perspectives. Two boyhood friends, Navy pilots stationed at Pearl Harbor, endure the trauma of the attack. I first recommended this film last year. It recalls a most unusual Christmas eve encounter—called “the Christmas Truce”on the World War I German front, between the Germans on the one side and the French and Scottish forces on the other. Joyeux Noël is on my list of movies to see again each Christmas season. For other posts I’ve written about this film, see Favorite Christmas Movie for 2009 and Joyeux Noël: A Film Discussion Guide. This may seem an odd entry. First, Christmas plays an understated role in the film. Second, this is a Billy Wilder comedy. Third, it is an older movie, filmed in black and white. But in its defense, note that Stalag 17 was one of the first films to join laughter with the ignominy of war. In it we observe a group of men courageously, though often raucously, making the best of a bad situation. Yes, there is comedy, some of it (okay, much of it) silly. This is, after all, a Billy Wilder product. But there also is pathos and suspense. On close inspection, many people today, with no war experience at all, can relate to the diverse feelings exhibited by these men, feelings that are compounded during the holidays. Loneliness. Unrequited love. Disillusionment. Alienation. Wilder was an intelligent director. He was interested in far more than the easy laugh. You see this in Stalag 17 when you pay close attention. Grown men revert to childishness to comfort themselves. They are resourceful, both at play and in the attempt to re-gain their freedom. Group dynamics are explored with sensitivity to how leadership and courage are perceived by others, what happens when the wrong person is blamed for serious misconduct, how trust is built up, then dissolved, and what people are willing to sacrifice for the good of others. Stalag 17 stars William Holden, Otto Preminger, and Peter Graves (of the original Mission Impossible TV series). The movie was the “inspiration” for the TV series Hogan’s Heroe’s, which even “borrowed” the Sergeant Schultz character. I saw this movie for the first time last night, and I recommend it. Do you have a movie to recommend that fits the category of this post? Of so, please let us know in the comment box. What’s to Like about “Inglourious Basterds”? I didn’t see Inglourious Basterds in the theater. It sat in my Amazon Video on Demand queue until last night. I know, it’s January 2, 2010. But within the past few days I watched a movie that ranks as one of the best—maybe the best—Christmas movie I’ve seen. It’s the foreign film called Joyeux Noël (translated, “Merry Christmas”). The setting is Christmas Eve, 1914, on the battlefield, with French, Scottish, and German battalions hunkered down in their respective trenches. Conditions are grim. But something very special happens. Plotting, casting, cinematography, soundtrack are all good. But crucial to the success of this film is that the story it tells is true. What Is the Movie Avatar About?